Walking along the street, I thought about the course of action that I should take. It might not seem hard at a glance, but the chain reaction as a cause of it should be taken into account too, which is a complicated thing to predict. Before I knew it, a group of foreigners who were looking at the city map stopped me to ask for directions as I was the only person around they could ask. I wonder where they are from? They look foreign, but they don't seem to be from western countries either. It seems that they are trying to visit a house of someone they know who was sent here for work reasons. However, only the address in Latin characters were given and nothing else except the phone number, which is of a mobile phone. The address system in Japan can be quite confusing, even to the locals, without a map. 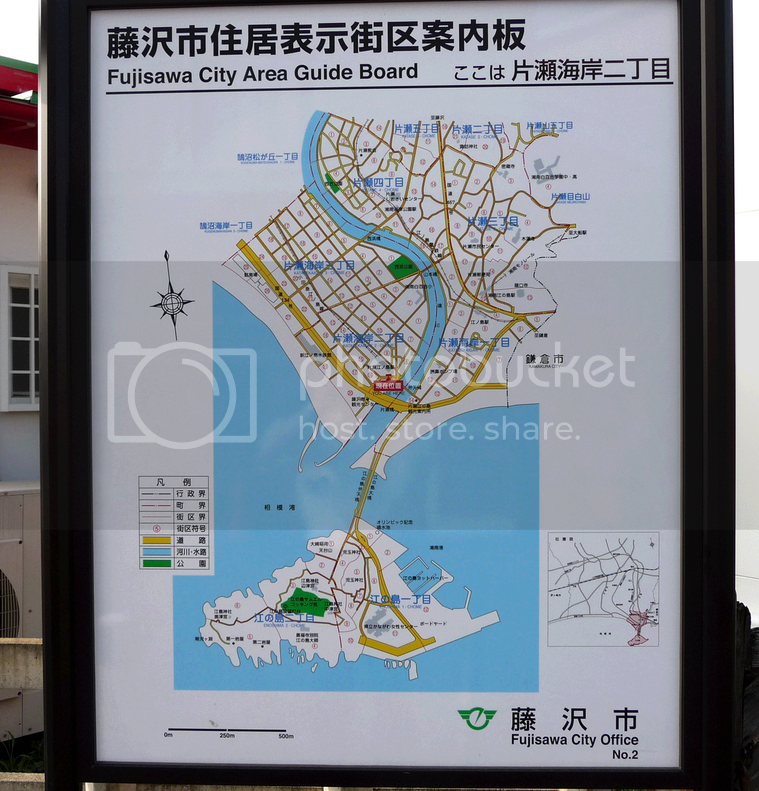 To make matters worse, all of the signs that mark the posting areas and maps of the city like the one they are looking at, contain only Japanese text. Even the order the address is written in western order is different than in Japanese. They probably don't even know that the character before chome (丁目) is a number in kanji instead of a more familiar Hindu-Arabic digit that is used in the western format. So, after analyzing the address, I showed them from our current location (which is already marked on the map) and pointed to where their destination is. Since they understood English, I mentioned what they should see along the way and wrote down names of places in Kana or Kanji as there's most likely no signs in romanised characters along the way. I would like to follow and guide them, but I'm not familiar with the area of the city they're headed to, and neither do they seem to trouble me further. As a token of appreciation, they gave me some denominations of their currency that I've never seen before in an unfamiliar language. I don't know what language it's in, but it does have the numbers in that language along with Hidu-Arabic numerals in them that says the digit value of it, which makes me wonder what is it's value in yen. Probably not much, and it's worthless here as the closest currency exchanger don't seem to offer this currency. Also, I've read somewhere that it just so happens that the two largest cities I know in this country are ranked the highest in the list of the cost of living of cities around the world for many years. Feeling generous, I gave them some of my money in exchange for the foreign money they gave me earlier. They had surprised smiles on their faces as it seem to have covered more than double the expenses they had spent getting here, including accommodation and flight costs. I assumed they came from the Indochina region from as they have they looked neither local (not understanding kanji) nor foreign (appearance-wise). Female classmate: "Good morning, Hisakawa-san! I was wondering who was walking in front of me until I came close enough to have that sweet smell you usually have your fans are crazy about. It's no wonder guys can't talk to you properly face to face." I didn't put up any perfume at all, but neither could I smell anything from myself. It could be one of the things my body does that I myself am unaware of. I smell nothing but the air around from my point of view. I first heard about it from someone that I met after arriving in that other dimension about 4 years ago, but didn't think much about it until I came back here 2 years ago when that other me (or someone occupying my original body) mentioned it as one of the blurbs on what to say to me when we were staring at each other in my room. I don't know what mom was thinking when she made me share the room with that other me despite the obvious gender differences. Maybe mom sees us as the same person, like monozygotic (identical) twins. Me: "Yeah, and it's hard to have a serious conversation with them. So, did you manage to finish the math homework from yesterday." Female classmate: "Ahahaha!.... Sorry, no. Those guys with us were distracted. It's my fault that I invited the guys over with dad around who kept talking about soccer among themselves and forgot about my homework." Me: "Yeah. Which is one of the reasons why you should have paid attention to the teacher and revise them, though your household might be noisy with the noises they make. Don't rely on me too much as I could suddenly fall ill right after lunch today or something and might not come back after a while. I've already been in and out of hospital many times for completely different reasons." Female classmate: ""Many people adoring an idol is nightmare for the idol themselves" is what you're saying? Hahaha. That's a good one." My random example of falling ill after lunch seem to come true. I didn't even think that it would actually happen as I, technically, can't fall ill. Since I was already seated, tucked in and leaning forward as the teacher writes something on the blackboard, nobody paid attention to me when I collapsed with my head sideways on the table and wasn't noticed until the teacher turned around. The teacher thought that I was sleeping and asked me questions relating to what he just mentioned. I managed to answer it without moving my head, which I didn't have the energy to after being weakened by this mysterious illness I'm having now. Suspicious of how I was able to answer his question correctly without looking or even moving a muscle and replied in a weak voice, he walked up to me. All of my classmate's attention were already on me by this time. Teacher: "Hisakawa-san, why did you... SOMEONE BRING HER TO THE INFIRMARY NOW!" That was the last thing I heard before I lost my consciousness. As I woke up, I found myself surrounded in an endless white space with no sense of where up is. I don't know if I'm lying down or standing up as I can't feel gravity and I could walk forward just as I thought I was lying down. This place felt neither hot or cold. What is this place? How did I end up here? According to the time and date on my phone, it's just barely a few hours after I collapsed with me and... what am I wearing? It wasn't until I took out my phone that I noticed that my outfit has been changed to a blazer uniform with the Mizuho Girls' Academy badge on it. The blouse underneath the blazer seemed tucked out, but not look out of place when not wearing the blazer. There's a tie around the collar of the blouse. My legs seem to be wearing some kind of heeled shoe commonly associated with formal occasions and there's something that I'm wearing that very much takes up the shape of my legs and making them look dark. Everything about this outfit feels so comfortable that it didn't even think about it at all. It's easy to tell the two apart, with the most obvious being the colour schemes and the length of the skirt. The current is somewhere below the knee level, while this new one is somewhere above the knee. Makes me feel like I'm attending some serious business meeting. Voice from nowhere: "Saeko, you're finally awake. I see you like the new Mizuho uniform already. I had deliberately made you sick earlier so that we have time here to test for any possible harmful bacteria that may have formed from wearing it without removing at all for many days was the original idea, but most of the testing happened to me instead and has been reduced to checking for any differences if worn by different genders as they both wear the same thing. We don't want real girls to change into guys, and neither do we want guys stuck as girls (unless they want to), so I was chosen as the "test subject" partly because of you, but let's talk about the design instead. After listening to the graduates and current students, plus some reviewing by the school committee, this new design is approved will take effect in the following academic year, though what you see yourself wearing now is the most formal version of it. Things like coloured hair and excessive accessories are still not allowed, however." That voice was Itsuki when in a form upon entering the campus of Mizuho and had not taken off what he had to wear in there after stepping out of the campus. It's almost like something magical as any males who step into the strictly female-only campus would be transformed into real girls. They would think and behave as though they were born one and not notice their transformation. They can still remember what they did inside though, and leaking out this phenomenon wouldn't even be on their minds. I don't know what happens if one were to call someone they know who is located outside while inside the campus though. Wait, Itsuki made me ill on purpose? Itsuki: "So, I have already tried it out myself while at home after making sure nobody else is at home for the past few days, and set up a small force field to simulate what would happen to me while entering the Mizuho grounds with this new design and for people like me. I need to check for bugs that haven't been ironed out and, for you specifically, check for any conflicts or if the exemptions are working. Some higher up made me wear this instead of you to check for problems for wearing it for long term, especially since I am a you-know-what. Our mom was shocked to see me like this: she could tell me from you apart though by just looking. Kind of unavoidable considering the duration. I've never been like this for longer than 8 hours at a time." Me: "So what are the changes you made?" Itsuki: "Design-wise, the summer uniform never changed. What has changed is that you could remove them as opposed to not being able to at all, on top of being able to change into other clothes for club activities or outside activity. The uniform also makes everyone's height would be adjusted to the same height, burst and feet sizes so they would all wear the same size. Everyone would look and behave like 15 years of age, including senior staff and little children. How would people like me, change back? It's the same way as the previous version." Me: "Don't you think that there are big problems with that?" Itsuki: "That? Hmm... It does seem to cause problems relating to the people they meet, but students are already told of that during the interview. As to tell apart students, teachers, non-teaching staff, and visitors from another, there isn't any but how neat their attire is does tell about the person's importance and/or serious they are. We don't want people to think too much about their appearance or distracted by that of others." Later on, Itsuki made me do activities that seemed to last like forever before I suddenly found myself lying in an armchair surrounded by large computers. Wait... all of that was not real? A virtual reality world? Girl: "We are at the underground lab of the Mihara Academy. I believe you have been here before in the other dimension." This voice came from a girl who seemed as young as I look (my body's age has been stuck at around 16 for a long time) who has all of the features Itsuki described earlier, but is wearing a female uniform of my middle school that mom gave me recently that I left behind in my room that is shared with Itsuki. I was expecting to see a 21-year old man instead of this young lady. The girl seemed frustrated that I even ask this question. What's wrong with her? Girl: "Hello...? I was the one who was spending a lot of time talking to you just a while ago! I'm your other half, Itsuki!" The voice sounded different back then, but that was because I was receiving what Itsuki was saying and not hear a voice at all wasn't on my mind. Me: "Why are you like that? You look 5 years younger than when you first brought me into the Mihara Academy." The Itsuki I saw back then is probably what the me of the dimension I was cloned in would look like at that time. Itsuki: "Didn't I already told you? I could change back at any time because I'm considered an admin. Anyways, just the day before this experiment started, I search for people that might know about Nanami's background. The best I could find was from the Miyazawa household, or Kotomi's father to be more specific, as they are the only relatives that live in this region, close to the capital, with the rest of her relatives living far enough to use the high-speed train or airplane to get to. Kotomi's dad and Nanami both have a common set of grandparents. Due to family complications, Nanami is the grandchild and Kotomi is the great-grandchild, with the latter being older than the former. Except for the grandparent in question, nobody else is aware about it." Hm? Nanami? What information does Itsuki have about her? What Itsuki had just said does explains Kotomi's very young looking parents for her age and her resemblance with Nanami. Itsuki explained that Nanami and Kotomi's families were at a large family reunion party 5 years ago, shortly after our graduation from middle school. Itsuki: "There could be complications should Kotomi come back from overseas and see you and Nanami at the same place. This is very likely because of what I foresaw something bad happening to her family next year, not that I want it to happen. Although Kotomi is her relative, those two, as of now, don't know each other. Since Nanami doesn't know people outside her immediate family, she could be very depressed from that event and Kotomi might move in to live with her before she marries me." Marriage... I was the one who first met her, but was forced out of my original body, whom she would be marrying. Me: "How could you be so sure that she would marry you?" There was no point asking that: I already knew from the so-called secret conversation with her every night. I'm just sad on what I'm missing out. There wasn't a hint that Itsuki was kidding about what was being said though.